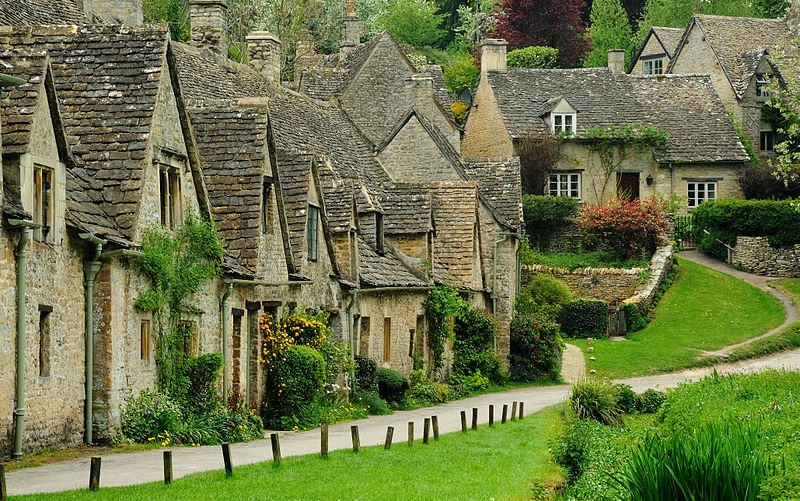 Perhaps one of the most picturesque of the Cotswold villages is Arlington Row in Bibury. Photo: WikiMedia.org. Warwickshire and nearby Gloucestershire in the southeast of England are renowned not only for their literary connections but the area's idyllic beauty of rural countryside and quintessentially English sights from "chocolate-box" villages and English gardens to formidable medieval castles and cobblestone streets. Many of you know Stratford upon Avon as the home of the literary giant William Shakespeare, and as such, you will be spoiled once you arrive in this enchanting place. However, there is so much more to see in the surrounding villages as well! 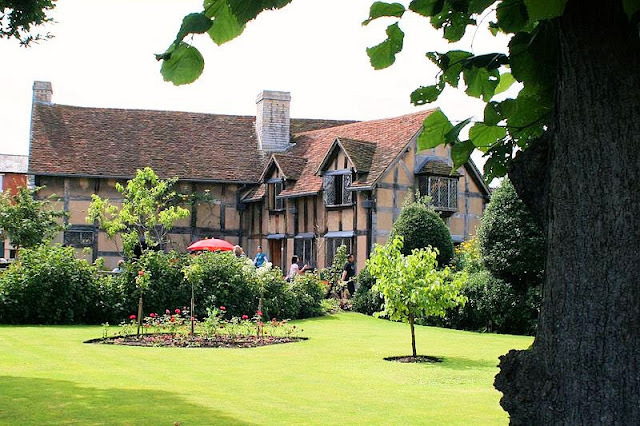 Let’s take a look at what to see and do in Shakespeare country today. 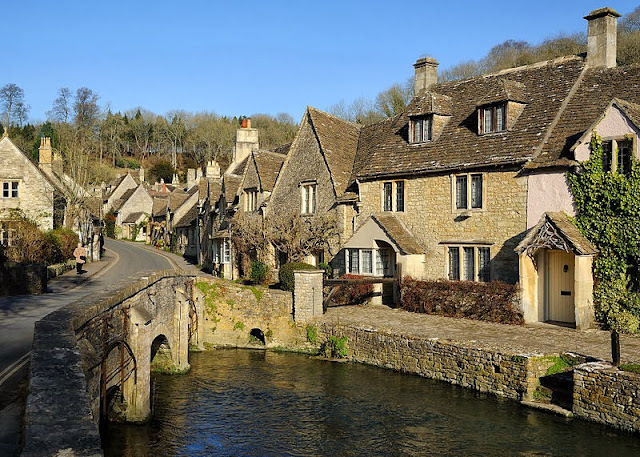 Picturesque Cotswold village of Castle Combe. Photo: WikiMedia.org. Stratford-upon-Avon—birthplace of William Shakespeare. Photo: WikiMedia.org. One such place is undoubtedly Shakespeare’s actual home, Stratford-upon-Avon. Henley Street is where he was born in 1564 and spent his childhood years. Managed by the Shakespeare Birthplace Trust and visited by Charles Dickens and Lord Byron, Shakespeare’s birthplace home and gardens are authentically recreated just as they would have appeared back in the 16th century. Be sure to stroll down the cobbled streets lined with black and white Tudor houses of Stratford, see a Shakespeare play or two at the Stratford Theatre, and even take a long walk along the river while you’re here. 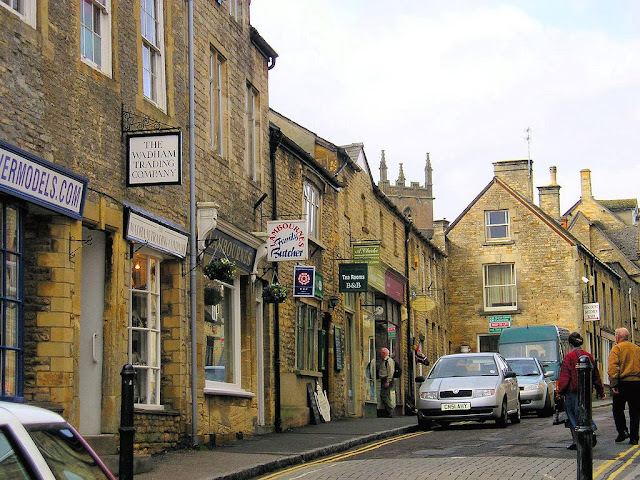 The charming medieval streets of Stow On The Wold in England. Photo: Wenno. For it was not Stratford alone that inspired Shakespeare as you will discover when you head south to the medieval Cotswold village of Stow On The Wold—a charming market town replete with town square, historic inns and country walks just five minutes behind the centre, plus a fascinating history of the role it played in the Cotswold wool industry with its annual wool fairs that started in the 14th century. Perhaps it was Chipping Campden, another significant player in the wool industry, with its rolling hills and picturesque landscapes that inspired him and other literary greats including Tolkien. Bourton on the Water, just 15 minutes from Stow, is often called "Little Venice" for its picturesque landscapes and low-lying bridges along the river Windrush. Don't miss Model Village, a fascinating 1/9th-scale replica of Bourton. Once you've visited the Cotswolds, it's easy to understand why so many artists and writers were and are inspired by such beauty. 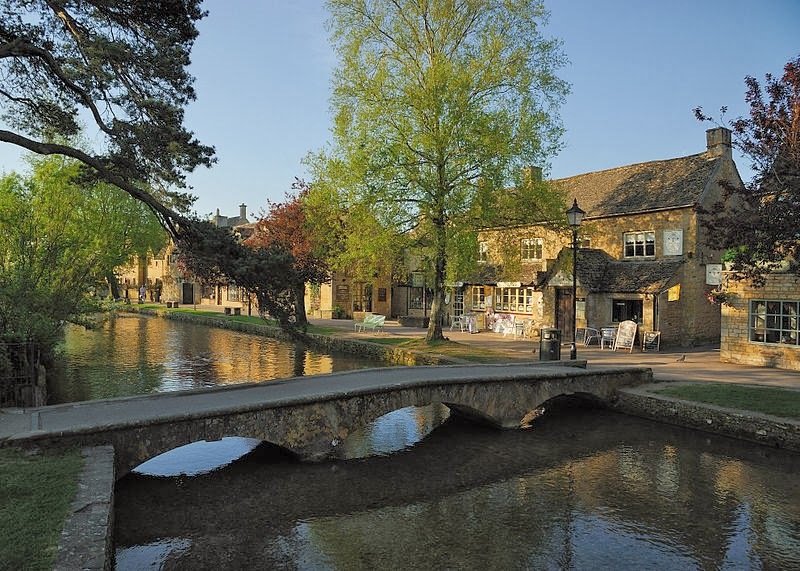 Also known as "Little Venice," Bourton on the Water beckons to artists and tourists alike. Photo: WikiMedia.org. The medieval Warwick Castle was designed by William the Conqueror himself. Photo: ShelbyPoppit. The glorious countryside around Stratford is home to historical sites as well. If you're a Medieval history buff like me, then a trip to Warwickshire would not be complete without visiting Warwick Castle. This imposing fortress has a fascinating history that dates back to 1068 when William the Conqueror ordered the construction of a "motte and bailey" castle which included a large earthen mound surrounded by a wooden stockade. Two hundred years later, the wooden castle was replaced by stone and the 14th century saw the construction of two towers: Caesar's Tower and Guy's Tower, plus the dungeon. Once you're here, tour the castle dungeons, immerse yourself into the interactive attraction "Merlin: The Dragon Tower" based on the popular TV series, your little princess with love the Princess Tower, walk along the endless battlements and even witness a jousting tournament. 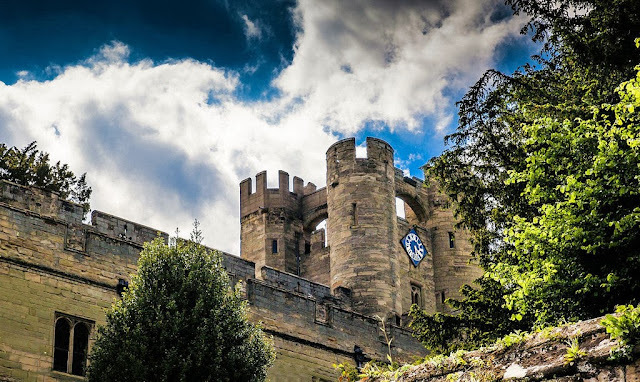 There's a fascinating history here so be sure to visit Warwick-Castle.com. This article was produced in partnership with Smartsave.com/Shakespeare. We visited Stratford-upon-Avon on a day trip from London this past summer and I loved it! One day wasn't even enough time for that one town alone - I would love to return and explore the area thoroughly. Hi there Lisa!! Thank you so much for stopping by and sharing your travel experiences!! I would love to spend a month at least!! The Cotswolds really is take-your-breath-away beautiful! There's something magical about these medieval English towns. I made it to Bath and Lacock last time; didn't get to Stratford. But that just means another trip. I love the absence of power lines. Hi there Marcia! I couldn't agree with you more!! I think all of England is quaint and charming and positively enchanting!! Thank you so much for stopping by! I loved my visit to Stratford-upon-Avon and Shakespeare's birthplace, but there's much more in the area I'd like to see. These villages look like wonderful places to go back in time. Hi Cathy and thank you so much for stopping by to share your thoughts! The entire region is quite enchanting if I say so myself!! A great destination, Jeff! The Cotswolds are always hyped up as such a beautiful part of England, but it is for good reason. Personally I found Bibury and Bourton on the Water were a bit clogged with visitors on coach tours, but if you have a car (and a little bit of time) it's so easy to enjoy other smaller but equally picturesque villages all to yourself. I particularly enjoyed wandering through Upper and Lower Slaughter (despite the names! ), Stanton and Snowshill. But there are no doubt countless others too! HI there Troy and thank you so much for your helpful tips! I have heard wonderful things about upper and lower Slaughter, terrible name huh. Thanks for stopping by. LOVE the timbered houses--and those little stone English cottages are enough to make me grab my sketchbook. Really enjoyed this picturesque post, Jeff! Hi there Lesley!! Thanks so much for stopping by! I think Arlington Row is my absolute FAV!! I could move there tomorrow!! Would love to see some of your sketches too!! When I was 15 I spent a month biking around England & Wales with about 20 other teenagers. I remember loving the area and just reading the words Stow on the Wold brings back memories. It is a fantastic part of England to visit. Hi there Leigh! You, my friend, are one very fortunate soul! I could have only dreamed of doing that at 15. You must have had the time of your life! Thank you for stopping by and sharing your experiences! I love to read comments like this! Absolutely beautiful photos! I love it! So English! HI there Agata! Oh couldn't you just live there???!! I would pack up right now and move if I could!! I love the Cotswolds!! Thank you so much for stopping by and sharing your comments! I really need to go there, I'm a big fan of all those British detectives cause of the beautiful old houses and surroundings. I am with you Freya! The Cotswolds have long been on my bucket list for years so I am with you! Let's go my friend! Thank you so much again for stopping by. I lived in Cheltenham for 5 years when I went to university and had a wonderful time exploring the Cotswolds. This post made me feel rather homesick! If you are going to the the Cotswolds don't miss Broadway - lovely little village. Hi there Runaway Brit!! I really enjoyed putting this guest post together on my site and after seeing this charming region of England, I really need to see it one day for myself. How wonderful that you lived there for five years! I bet you LOVED it!! Broadway sounds positively enchanting! Thank you so much for stopping by and sharing your thoughts.